#8 Arbitrage Diary – Optimise Prime: Transforming your Profits! Hey dude, hope you’re well! Apologies for the title pun! But I couldn’t resist it. As Advertisers Variable/Metric Aiming for? Outbrain CTR Doesn’t matter that much! As Publishers Variable/Metric Aiming for? There’s a few other things that you can optimise (can you think of what they are?) but these are the most important ones that we focused on first and that you should too to get the biggest transformations for your P n’ L.
The second is the AdSense (or Content.Ad) CTR, i.e. how much of the traffic that makes it to your site clicks on some advert that makes you money. The third is the AdSense (or Content.Ad) CPC, i.e. how much money you make when a person on your site clicks on an ad. The basic formula is that if the second and third outweigh the first, then you will make money! Hopefully from that little explanation it should be clear that if you can make your Outbrain CPC as small as possible, then, well, it’s a really good thing! In general, if you set a too low CPC then Outbrain won’t send you any traffic (it’s a marketplace where you’re bidding for traffic – so a low bid will see you get outbid by others) – so you won’t spend your full daily budget. 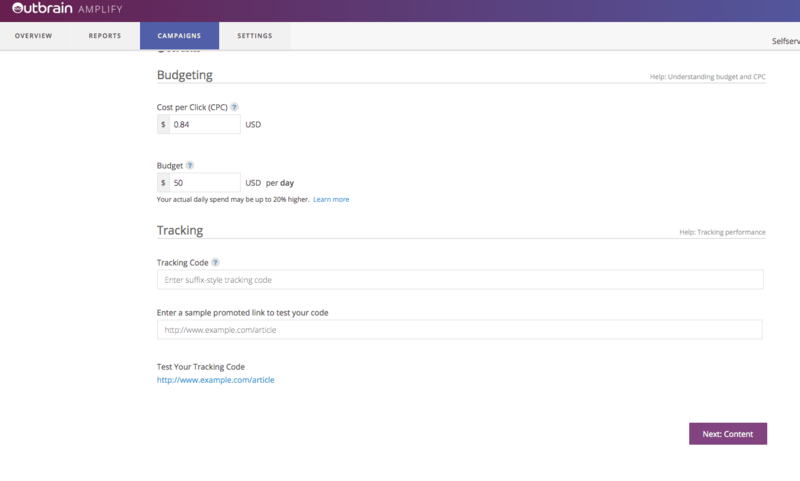 Set it too high and you’ll easily get traffic, but not much: you’ll get fewer clicks for your total daily budget because you’re paying more for each click. Therefore, your budget will get eaten through very quickly with not much traffic actually hitting your site. At all points of a campaign the ambition should be to find a CPC that is as low as possible but for which your total daily budget all gets spent. Here is table showing the Outbrain CPC, budget and actual spend for one of our first campaigns, and the profit/loss from AdSense (so there was some profit from our Content.Ad widgets as well that hasn’t been included here). You can see that between Day 6 and 15 we were struggling to use up all our daily budget, so we carried on playing around with the CPC – increasing it – to ensure that it was fully spent: low CPCs aren’t always best, there is a sweet spot! For us, for this campaign, it was 0.14: we ran with that CPC for the another 26 days after Day 17 (until we ran into other issues – but more on that in a future post!). Takeaway: Bring down CPC slowly from $0.5. Aim to get it below $0.15. Play around with it so that you strike the best balance between fully spending your budget and profitability per click. Because you pay each time someone clicks through to your site from an Outbrain ad, you want to ensure that the people who do click are most likely to convert (click on another ad) when they get to your site. One of the ways to do this is to get Outbrain to stop showing your ads on ‘bad’ websites. Not PornHub or Fox News (that might do pretty well to be honest) but rather which sites have users that tend not to click on ads on your site once they arrive. To do this you need to use the data you collect over the first few (at least three days) of running a campaign. You can do this all within Analytics. Go to Google Analytics > Acquisition>Campaigns>All Campaigns, then click into the campaign name in question and Analytics should present you with Source/Medium (which we set up using the UTM tracking codes last time) as the left-hand column. Now click on the AdSense tab. Change ‘show rows’ to get the most data on the page at once and then sort the data by increasing AdSense CTR (i.e. starting with 0%). (You can also export this data to Google Docs, which can sometimes be easier or just look at it in Analytics). This data is for Day 1 to 4 of the campaign I showed you the CPCs for above. Now your data is in front of you, you want to weed out the traffic sources that have provided you with punters who have been on your site but not clicked on any adverts! The b*****ds! If you’re slightly lazy, you can use AdSense Page Impressions as a measure of the number of punters a source has sent you and all the ones with 0% CTR are the ones that haven’t made you money (at least not on AdSense, they may have made you some money on Content.Ad). So the ones you want to weed out are any with 0% CTR but high (let’s say more than 5 AdSense Page Impressions). The worst culprit from that screenshot would be 185984 with 48 impressions but no clicks. If you’re less lazy, you can also create a customised Analytics layout so that instead of AdSense Page Impressions you can compare the number of Sessions, which gives you a more precise figure on how many people have visited from each source, rather than how many ads they were shown. However, you’ll see that the sources you’d be likely to cull are the same in both cases: e.g. the worst culprit is still 185984 with 12 sessions (and obviously still no clicks). Outbrain only let you block 40 traffic sources so we’ve since found it’s worth doing it in a couple of batches. Block the worst 20 after Day 4 and then the block the worst 20 after Day 8. To block the sources, just email Outbrain and give them the Source numbers. How effective is this optimisation? Well, if you look at the CPC table above you can see the combination of reducing the CPC and blocking the worst traffic sources at the end of Day 4 resulted in things really starting to pick up for us. 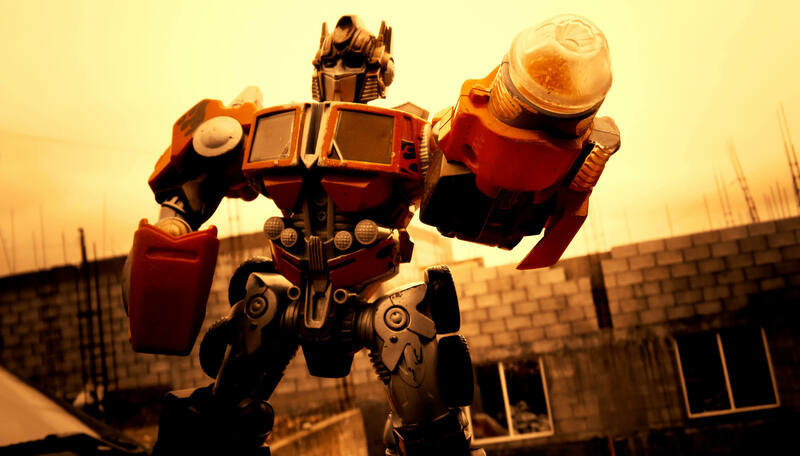 This method can also be used to spot and block bot traffic. Outbrain CTR: Why it’s not important, but what is! When we started we got confused thinking that the Outbrain CTR (number of clicks divided by number of impressions) was really important: it’s not. A higher one is great (it shows that you’ve written a catchy headline and title combo) but out of the, let’s say, 25 headline/image combos that we showed you how to set up last time, the one with the highest CTR might not always make you the most profit!! In fact, sometimes the ones with the highest CTR (which Outbrain will preferentially drive traffic to once it’s algorithm has optimised your 25 combos, because it sees them as the most popular) can cost you money! Think of it like this: if all the people who jumped at the chance to click on your advert (for which you’ve paid Outbrain for the privilege) suddenly get to your site but don’t convert, or stay on your site for very long, then you ain’t making any money from them. Why might this happen? Perhaps the article wasn’t what they expected? Perhaps the headline/image combo didn’t ‘prime them’ to want to click on an ad when they got to your site. Perhaps the headline/image combo appealed to an audience who didn’t like your content or the ads on your site? There’s a bunch of reasons but at this point all we care about is finding which headline/image combos will make US (not Outbrain) the most money, and getting rid of the rest. Once your campaign has run for a few days you need to figure out which headline/image combos are giving you positive returns and keep them, and which are giving negative returns, and pause them. You need to end up with spreadsheet like this! The important column AdSense revenue/Outbrain cost is on the far right-hand side. First, download the Clicks, Spend, Impressions and CTR data from Outbrain into a spreadsheet via the Reports tab (choose the relevant campaign, time period and then click on ‘Content’). Assign labels to each of your headlines and images and make a note of these next to each entry as in the spreadsheet above (you’ll need this to keep easy track of them later). Now, the annoying part. For some reason, Outbrain doesn’t give you an easy way to find the Content number which gets sent via the UTM tracking code to Analytics. Therefore, you have to do it manually for each headline/image combo. Go into the Manage Content section and hover your mouse over the image. You can then read the Content tag from the URL that will appear in the lower left-hand side of your page. Here’s an example, using that mistake I told you about in that last post where we accidentally tried to promote one of Rihanna’s videos! Record these next to the relevant headline/image combos, such that you now have a spreadsheet with Content #, Headline #, Image #, Clicks, Spend, Impressions and CTR. Sort this data in increasing Content #. Now download the Analytics data to match up with the Outbrain data. 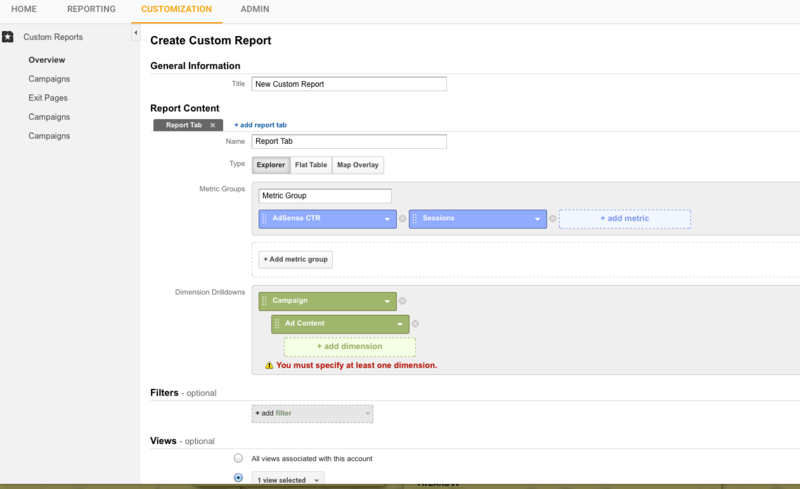 The easiest way is to set up a customised table by going to Customization>New Custom Report. You want to include columns for Sessions, Pages per Sessions, AdSense Revenue, Ads Clicked, Page Impressions and AdSense CTR by clicking on “Add Metric” and searching for those terms. And you want to be able to drill down into Campaigns and then Ad Content, by selecting those in the ‘Dimensions Drilldowns” field. 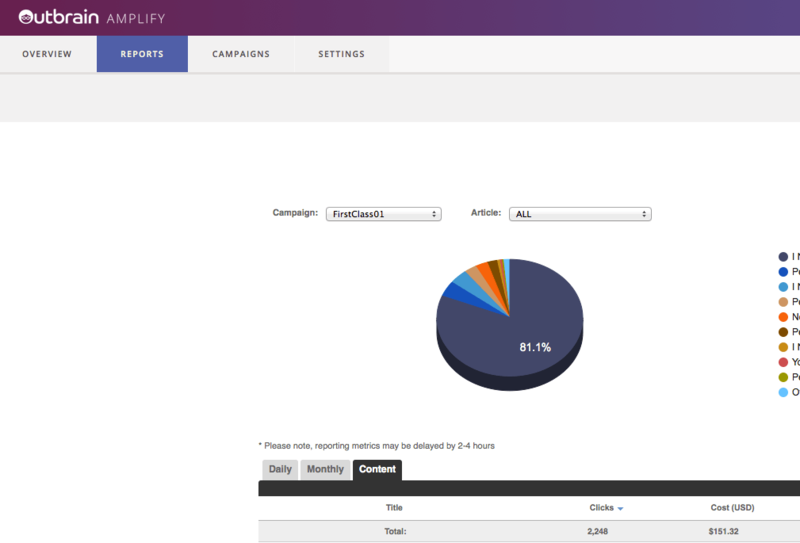 Save the table, choose the relevant time period and campaign, and then sort the data via increasing Ad Content number. Then export it to a spreadsheet. Once you have the Analytics data, you can paste it next to the Outbrain data, using the Ad Content # to match up the entries. There might be fewer entries from the Analytics data because some headline/combos, while they will have been shown by Outbrain, might not have received clicked through traffic and thus will not have been registered by Analytics. Once you have all the data aligned, you need to calculate the AdSense Revenue/Outbrain cost in new cell for all individual headline/image combos. These are the headline/image combos that have been making you money! These are the ones you want to keep! These are the ones I’ve highlighted green in the example spreadsheet above. These are the headline/image combos that have been losing you money! These are the ones you want to get rid of (or at least monitor their performance carefully and get rid of them once you have some more data)! These are the ones I’ve highlighted blue in the example spreadsheet above. Because they have received no clicks and thus there is no data to assess. This means that the headline/image is unappealing to the people who Outbrain have been advertising it. These are the ones I’ve highlighted pink in the example spreadsheet above. One thing to watch out for is how many clicks there have been on both the Outbrain and Analytics side. If there have been a lot (e.g. the example with 1282 Outbrain clicks in the picture above) then you can rest assured that the AS Rev/OB Cost value is a good reflection of how that headline/image would behave if you kept throwing money at it (in that particular case, by being profitable for us!). In contrast, if there’s only been a few clicks then you can be less sure. Now you’ve got these numbers you can choose to disable headline/image combos that lose you money, or restart new campaigns with the best performing combos. In this particular case, we started a new campaign just with the top performing, reliable combo (59848411), which has since carried on performing very well for us (although we continued running the original campaign to gather more data). Right, that was a pretty beefy entry – and I only covered the first three possible optimisation techniques from that I list I showed you at the top of this blog! 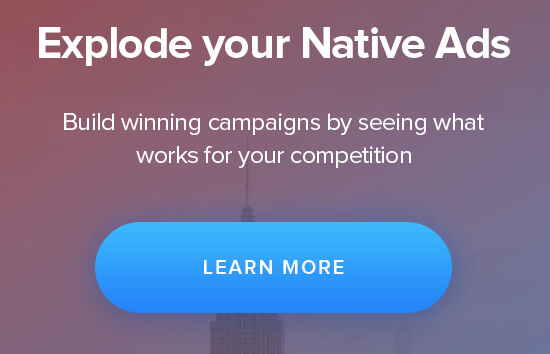 However, these in our experience – and from what we’ve learned from doing some coaching sessions with the Native Ad Buzz crew – are three of the most important ones, and ones you should do first at the start of every campaign. If you can lower your CPC, cut out bad performing traffic and identify your headline/image winners, then you will be well on the way to raking in the cash! In the next blog Jake will take you through more of those optimisation techniques on that list to push your ROI even higher!